Driving from Morro Bay to Big Sur takes about three hours. The 108-mile trek on Highway 1 lends itself to not only soaking in the scenic route but also pit-stopping along the way. The highway re-opened at the end of July after being closed for 14 months, and its closure took a toll on businesses and tourism in the surrounding communities. Last year, three natural disasters put discovering the coast on hold. In the beginning of 2017, gentle rain became pummeling storms, and naturally, the freshly softened mud and rock started moving downhill. ONE ROAD TO CONNECT THEM ALL The closure of Highway 1 affected the northern communities on the Central Coast. In March of that year, a landslide severely damaged the Pfeiffer Canyon Bridge—it was condemned, demolished, and eventually rebuilt. About 35 miles south of the bridge was closed to vehicles. Two months later, the Mud Creek slide gave way and covered about 12 miles of road—from Ragged Point to Gorda. Jennifer Little, the city of Morro Bay's tourism manager, said that on top of those two disasters, Highway 41 was also closed due to a mudslide that was 6 miles east of the city. "It was months after months that we were finally going to see a turn and then the next thing would happen. With all three of those happening together, it was really devastating for all of the North Coast, not just Morro Bay," Little said. She said businesses in the area were—and still are—stable, but it was definitely a struggle. Little said that tourism was also seeing a decline. Visitor occupancy in April 2017 was at 71 percent, and a year later, it had dropped to 61 percent. But it didn't necessarily translate to a drop in transient occupancy tax revenue for the city. In the 2015-16 fiscal year (from July to June), Morro Bay collected $3.1 million; for the 2016-17 fiscal year, it pulled in $3.3 million; and in 2017-18, it was $3.4 million. She contributes the uptick to collaboration between the city's tourism department and the community. Little and her team created five new events to entice potential tourists to Morro Bay. There was Winter Fest, a 12-day festival with activities occurring throughout the city, and the Santa crawl, which called for participants to dress up as Santa or an elf and hit up restaurants and bars hosting wine tasting. The crawl was so successful that the team created another for Saint Patrick's Day, called the Leprechaun Crawl. Last year was also the first time that waterfront restaurants sponsored the annual Lighted Boat Parade in the Morro Bay harbor. Participating restaurants teamed up with commercial vessels and decorated them for the parade's first night of the event. "I mean we really buckled down and just worked really, really hard to make the worst a little less bad," she said. "Everybody saw the need that we all came together to better our situation." While the community did face a hardship, business owner Sandi Twist had a different take on the challenges the community was facing. Twist owns The Paddleboard Company which opened up on the Embarcadero in 2010, after the only other specialty shop closed. She said when the road closures occurred, it didn't affect her too much because winter is her off-season—she banks on selling apparel then. She did hear other business owners express their concerns but felt that—although it wasn't the number of desired visitors—people were still discovering Morro Bay. She thinks that it was Morro Rock that drew them in. "The rock is kind of our most iconic thing, and people would just drive Highway 1 and say, 'There goes the rock, OK, keep going.' But because Big Sur wasn't open, people were more likely to stay and have this be a stopping point," Twist said. Communities that are farther north on the coast have dealt with the lack of out-of-town vacationers since early last year. While the Pfeiffer Canyon Bridge was reopened in October 2017, and the mudslide on Highway 41 was cleared away and reopened for access—Highway 1 didn't open until July 2018. A month before the new road's opening, the Unincorporated County Tourism Business Improvement District Advisory Board wrote a letter to Caltrans to demonstrate the impacts of the highway's closure. The letter stated that the board was concerned about the closure's continued impact on the Ragged Point, San Simeon, Cambria, and Cayucos lodging properties that represent more than 73 percent of the tax and assessment contribution within the county's tourism district. "In recent months we have seen a decline up to 30 percent in transient occupancy tax/bed tax that is directly related to the Highway 1 closure," the letter stated. In addition to the slump in lodging, Hearst Castle's visitors dropped by 15.5 percent. The Elephant Seal Rookery in San Simeon experienced a 23.4 percent loss in visitors for the first four months of 2018. 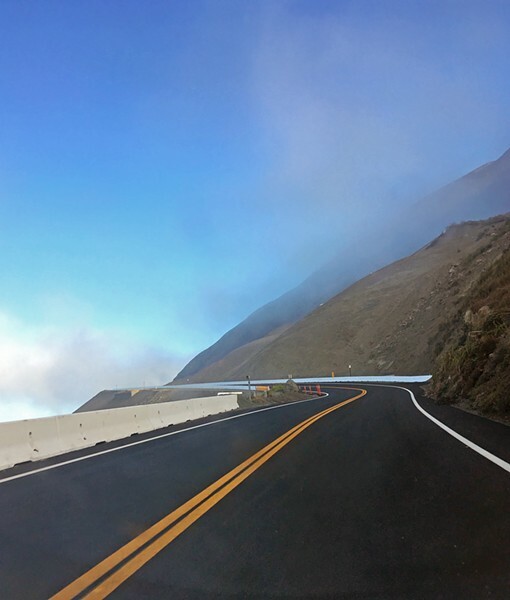 The letter urged Caltrans continue its plan to reopen Highway 1 with the new highway running across the top of the Mud Creek slide. Now that the highway's open for business, San Luis Obispo District Superintendent for State Parks Dan Falat said that just taking a drive on the highway, it's easy to notice a difference in the number of people stopping to enjoy the beaches or take a hike.